Dr. Redziniak is Board Certified by The American Board of Orthopaedic Surgeons and has received an additional Subspecialty Board Certfication in Sports Medicine. His practice emphasis is on all aspects of care of the shoulder and knee as well as other sports related injuries. He also specializes in fracture management. Dr. Redziniak is a graduate of the Robert Wood Johnson Medical School (RWJMS) in New Jersey, where he obtained his Medical Degree. During residency, he spent time in New York studying orthopedic oncology at the Memorial Sloan Kettering Hospital, and was named Chief Resident at RWJMS in the orthopedic program. In addition, he was the AOA / Zimmer Resident Leadership Award Winner. He completed a Sports Medicine Fellowship at the University of Virginia, where he took care of The University of Virginia Athletic Teams and the James Madison University Athletic Teams. Dr. Redziniak is currently the Chesapeake Bayhawks' Orthopedic Surgeon and Sports Medicine Physician. He also serves as the team physician for Bowie State University, Anne Arundel Community College, and Severna Park High School. He is a member of The American Academy of Orthopedic Surgeons (AAOS) and The Arthroscopy Association of North America (AANA). 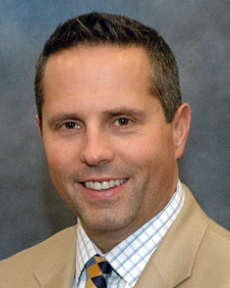 He is an instructor at the AANA cadaver surgical skills lab for arthroscopic procedures of the knee and shoulder. Dr. Redziniak completed a graduate program at Johns Hopkins Bloomberg School of Public Health (M.S.) and received his B.A. from The Johns Hopkins University. He was the starting quarterback for the Johns Hopkins University Varsity Football Team. He was named the Burger King National Scholar Athlete and National Scholar Athlete by College Football Review. Other sporting achievements include New Jersey All State Quarterback and All State Lacrosse Midfielder. Dr. Redziniak has been involved in many research studies involving sports injury repair and rehabilitation. He has been published in peer review journals and has presented at national meetings. He enjoys golfing, skiing, boating, fishing and scuba diving; and currently resides in Annapolis with his wife and two children. 2011 Lashgari C., Redziniak D., The Natural History of Rotator Cuff Tears, Current Orthopedic Practice, Volume 23, 2012, 1, 10-13.2010 Redziniak D., Diduch, D., Mihalko W., Fulkerson J., Novicoff W., Sheiani-Rad S., Saleh K., Patella Instability, Instructional Course Lecture, Volume 59, 2010, 195-206. 2009 Redziniak D., Tremme G., Turman K., Hart J., Miller M., Diduch D., Arthroscopic Rotator Cuff Repair using a Knotless Suture Anchor Fixation System, AJSM 2009; 37, 1106-1110. 2008 Redziniak D., Tremme G., Turman K., Hart J., Miller M., Diduch D., Arthroscopic Rotator Cuff Repair using a Knotless Suture Anchor Fixation System, Abstract presented at AANA, April 26, 2008, Washington D.C.
2008 Redziniak D., Tremme G., Turman K., Hart J., Miller M., Diduch D., Medial Patellofemoral Ligament Repair in Patients with Lateral Patellar Instability, Abstract presented at AANA, April 24, 2008, Washington D.C.
2008 Redziniak D., Tremme G., Turman K., Hart J., Miller M., Diduch D., Patella Instability: Current Concepts Review, JBJS-Am 2009; 91, 2264-2275. 2008 Redziniak D., Diduch D., Turman K., Hart J., Grindstaff T., MacKnight J., Mistry D., Methicillin Resistant Staphylococcus Aureus (MRSA) in the Athlete, Int J Sports Med 2009; 30 557-562. 2008 Nitche, J., Masella, R., Redziniak, D., Sagebien, C., Subtrochanteric Femoral Stress Fractures in Patients on Long-Term Bisphosphonate Therapy, OTA Poster #70, Oct 15, 2008, Denver, CO.
2006 Chen A., Alan R., Redziniak D., Tria A., Quadriceps Sparing TKA - The Initial Experience with Results at Two to Four Years, JBJS-Br 2006; 88-B, 1448-53.